These reading worksheets were written at a first grade level, but it's important to remember that reading level varies from student to student. After they read the passage, students then answer the comprehension questions that follow. Reading comprehension worksheets that are aligned with the Common Core Standards are indicated with the common core icon . Click the icon to view standards. Bella and James are playing a rhyming game. When it's James' turn to rhyme words, he makes Bella laugh. No one likes to be stuck inside when it's raining out. Read this story to find out what James and Bella do to pass the time indoors. A dog keeps finding different colored balls. Find out what the dog does with each ball. Then, answer the comprehension questions. This is a cute fall poem about apples. Perfect for younger readers in kindergarten through second grades. Lily and her mom are having a picnic. They hear lots of beautiful music. Where are the sounds coming from? Josh is an independent young boy who gets his own snack and puts his dishes away. 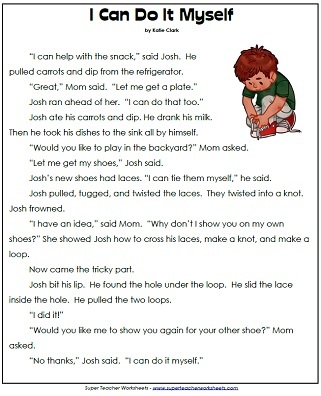 However, when he tried to tie his shoes by himself, he makes knots. Can he do it himself without help? Lily and Mom want to exercise, but their dog Pep wants to play. Activity includes comprehension questions, vocabulary words, and a writing prompt. An answer key is also included. Lily and her favorite stuffed animals are ready for Mom to read them a bedtime story. Can they stay awake until the end? This reading activity includes comprehension questions, a writing prompt, and vocabulary game. Mom can't find her keys anywhere! Together, she and Lily search the kitchen for the missing keys. Will they be able to find them? 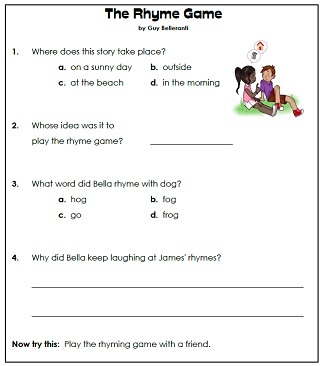 Reading comprehension questions, vocabulary from the story, and a writing activity are included with this worksheet. James and Bella want to play catch outside, but they can't find their ball! Will their dog, Penny, help them out, or does Penny have a different game in mind? 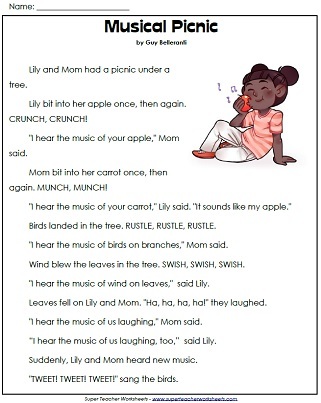 This reading activity includes a writing exercise, vocabulary matching from the story, and comprehension questions. James has the hiccups. Bella tells him to stand on his head in order to get rid of them, but James has his own ideas. This reading comprehension activity includes vocabulary words, a writing prompt, and comprehension questions. Cassie and Eli play a fun game with shadows. This story includes reading comprehension questions, vocabulary matching, and a writing prompt. Zoe, Grace, and Devin go outside to play in the snow. When Grace and Devin can't decide what kind of snowman they should build, Zoe comes up with an idea they'll all like! Activity includes comprehension questions and vocabulary words. When Brandon wants to introduce Nick to his "kitty," Nick is expecting to meet Brandon's pet! Who he meets at the end of the story is definitely a surprise! Uh oh! Sophie only has three apples to divide between she and her three friends. Can they come up with a plan so everyone can enjoy Sophie's apples? A fall-themed reading comprehension activity with follow-up questions, a writing prompt, and vocabulary. James and Bella play a fun game in the yard with Bella's dog, Penny. They describe all the things they feel. What feels best of all? Reading comprehension activity and vocabulary words are included with this worksheet. Read the fiction story about Jen and her dog Max. Students then answer a series of questions that go along with the story. Aunt Lee doesn't have normal pets, like cats or dogs. She has chickens! Find out where she keeps them and what they eat. A baby and his mother are in the park blowing bubbles. Read about a child who helps out at home with a new baby. Four reading comprehension questions follow the story. Hippo keeps bothering frog by eating the lily pads, squishing the mud, and blowing bubbles in the water. How can they work it out? Tom is excited to be at the beach, but how can he have fun without any friends to play with? Jill's cat, Sam, gets lost under the bed when he chases his bell. Mary found an earring, but who does it belong to? Read along as Mary solves the mystery. What happens when Dad discovers a messy bedroom? After reading about a child who cleans up their room, students check their understanding by answering the questions. Jordan can't remember where he set down his bowl of ice cream! He and Ava better hurry up and find it before it all melts! Reading activity includes comprehension questions. An answer key is included. A frog is lost and cannot find his way home. A fun, repetitious poem about a buzzing bumblebee. A cat is chasing a mouse around the house. The mouse sneaks bread, cheese, and crackers into his hole. Find out why the cat can't catch him. Max is getting ready for his birthday party, but the baby is popping the balloons and ruining his party. Rosie tries all of the rides at the playground, but which one is her favorite? Beth and her friends choose instruments and form a rock band. Ian can't think of just the right name for his new dog. The names that his father suggests just don't seem right. Fresh snow has just fallen and Ian and Sir Wags-a-Lot can't wait to play in it! Read to find out about Ian's time in the snow, and the snowman he and his friend Anna build. Ian is having trouble deciding on a Halloween costume. Can Sir Wags-a-Lot help him to find the perfect one? While Ian is asleep in his bed, he awakes when he hears the door creak open. Then he hears a strange sound. Is it his dad, his mom, a ghost, or something else? Halloween is finally here and Ian, his dad, and Sir-Wags-a-Lot go out searching for the perfect pumpkin. Will Ian find what he is looking for? Ian knows what he wants to be when he grows up, but can Sir-Wags-a-Lot figure out what he wants to be too? Reading comprehension questions, writing prompt, and vocabulary words are included. Ian, his dad, and Sir-Wags-a-Lot are fishing in a canoe. Every time a fish comes near the boat, the dog barks and scares it away. Ian takes Sir Wags-a-Lot camping with Dad. Dad thinks Sir Wags-a-Lot will get in the way. Can Sir Wags-a-Lot show he's useful instead? Join Ian and Sir-Wags-a-Lot as they make an extra special birthday cake for Dad! Reading comprehension questions, vocabulary words, and a writing prompt are included. Ian isn't the luckiest when it comes to catching a baseball at the ball game. Can his dog, Sir-Wags-a-Lot, help him out? Ian can't find his orange anywhere! Can Ian's dad and his dog, Sir Wags-a-Lot, help Ian find his lost orange? When all Ian's family members are too busy to listen to him read, what will he do? Activity includes comprehension questions, vocabulary words, and a writing prompt. Ian needs to find the right tree for the tree house his dad is building. Ian asks his dog for help because his dog is good at finding things. Ian has a brand new tree house, but something doesn't seem quite right? What's missing from Ian's tree house? Find out in this reading activity geared toward a first grade reading level. Ian is going to a new school and worries nobody will like him. But Sir Wags-a-Lot helps Ian make new friends. Ian and his dog, Sir Wags-a-Lot, want to leave Christmas cookies for Santa. Which type of cookies will they choose? Sometimes the early bird catches the worm.... but not in this story. A non-fiction passage with information about fireflies. Ben and his dad go fishing in this story. After reading about their adventures, students can answer the four questions that follow. Cute poem about playing with simple, easy-to-read words for first grade students. Zac and Sam are at the store, but they can't agree on what to buy. James and Bella are guessing what Mom is making for a tasty snack. Can they put the clues together and figure out what it is? A family travels to grandma's house in their new car. Dan can sit and give five with his paw. But what happens to Zac when he has Dan fetch a ball from the pool? Mia helps her brother Nate look for his missing book. Will they be able to find it? This reading comprehension activity includes vocabulary words, comprehension questions, and a writing response. Matt searches everywhere for his missing pencil. You wouldn't believe where he finds it. It's farmer Ted's birthday, but he has forgotten! Read "Black Cat, Tan Cat" and color all of the words with a short a sound. Cody finds a rock in the driveway... and it has orange eyes! His parents tell him that what he's found is NOT really a rock. Hunter is making a special card for his mother. Read about red, yellow, blue and green things in nature.